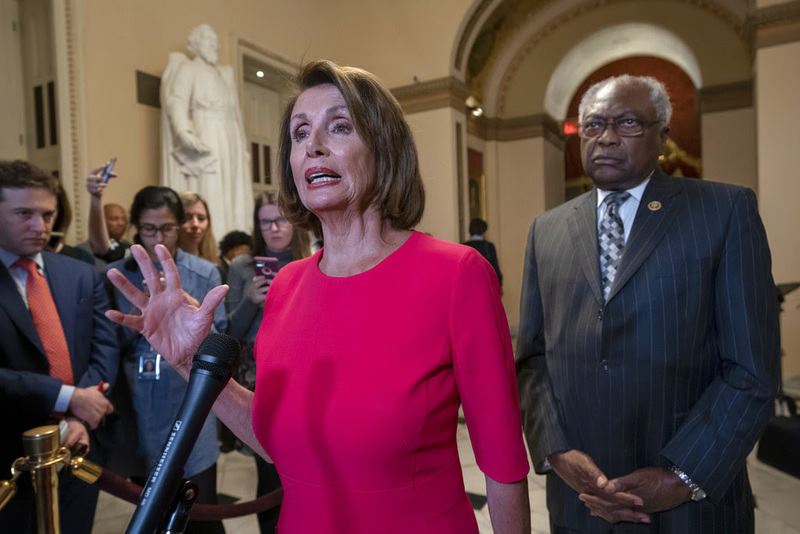 THE LEAD STORY – THE WALL BETWEEN TRUMP AND PELOSI: Newly empowered House Democrats late Thursday passed a bill to reopen the government without funding President Trump’s border wall … In a news conference Thursday night, newly-elected House Speaker Nancy Pelosi broadly discussed the ongoing partial government shutdown, which has dragged on since Dec. 22. Even as she said she would be willing to fund border security, Pelosi called a border wall a symptom of an “old way of thinking” and promised not to fund it. “We’re not doing a wall. Does anyone have any doubt that we’re not doing a wall?” Pelosi told reporters. Earlier Thursday, President Trump made a surprise appearance in the White House briefing room to congratulate Pelosi on once again becoming House speaker and to stand by his repeated calls to fund a border wall. At the president’s request, Pelosi and other congressional leaders are scheduled to return to the White House on Friday morning to resume talks to end the shutdown. APPLE JITTERS ON WALL STREET: Japanese shares tumbled and Shanghai’s benchmark surged Friday as Asian markets steadied following a technology-led sell-off on Wall Street … The Nikkei 225 index started its first trading day of 2019 by falling more than 3 percent. By midday, it was trading 2.8 percent lower at 19,465.36 as technology and electronics makers slumped. But Hong Kong’s Hang Seng jumped 1.3 percent to 25,380.37. The Shanghai Composite rebounded 1.8 percent to 2,509.02. Friday morning’s developments come after U.S. stocks got slammed across the board on Thursday as investors reacted to Apple’s rare guidance cut and amid rising concerns that the U.S. economy may face new headwinds in 2019. ‘Seinfeld’ is the latest TV classic to offend millennials. UConn women’s 126-game winning streak ends with 68-57 loss to Baylor. NFL playoff matchup features Howie Long’s sons on opposite sides. U.S.-China trade delegation to meet Monday, Tuesday. Democrats vs. U.S. business: Which companies could feel the pressure? Kennedy: Time for a new Trump game plan. Google stashed billions in offshore tax haven. Southwest Airlines founder Herb Kelleher dead at 87. FOX & Friends, 6 a.m. ET: Special guests include: Reggie Singh, brother of Ronil Singh, the California police officer allegedly killed by an illegal immigrant; Rochelle Ritchie, a political analyst; Liz Peek, a Fox News contributor; Kurt Knutsson, the Cyber Guy; Anthony Scaramucci, the former White House communications director; Lara Trump, a former campaign adviser to President Trump. The Story with Martha MacCallum, 7 p.m. ET: Lisa Boothe, a Fox News contributor; Caroline Polisi, a legal analyst; Jessica Tarlov, a Fox News contributor. Hannity, 9 p.m. ET: Gregg Jarrett, Fox News legal analyst; Tammy Bruce, Fox News contributor. Mornings with Maria, 6 a.m. ET: Special guests include: Bryce Doty, senior vice president and senior portfolio manager with Sit Fixed Income; Sean Kelly, SnackNation co-founder and CEO; U.S. Rep. Jim Banks, R-Ind. ; U.S. Rep. John Garamendi, D-Calif.; Robert Wolf, former economic adviser to President Obama. Varney & Co., 9 a.m. ET: Larry Kudlow, National Economic Council director; Lara Trump, Trump 2020 senior adviser; U.S. Rep. Jason Smith, R-Mo. ; Paul Conway, former Labor Department chief of staff. Cavuto: Coast to Coast, Noon ET: Anthony Chan, JP Morgan Chase chief economist. Making Money with Charles Payne, 2 p.m. ET: David Kotok, Cumberland Advisors chairman and chief investment officer; Danielle DiMartino Booth, CEO and director of intelligence at Quill Intelligence; John Lonski, chief economist at Moody’s. After the Bell with Melissa Francis and Connell McShane, 4 p.m. ET: Steve Forbes, Forbes Media chairman; U.S. Rep. Drew Ferguson, R-Ga. The FOX News Rundown podcast: Nancy Pelosi is elected Speaker of the House for the second time and the 116th Congress is sworn in, all while the partial government shutdown continues. FOX News’ Jared Halpern discusses the stalemate over border wall funding and how both parties will deal with the new year. Washington is still abuzz in the wake of Sen. Mitt Romney’s Washington Post op-ed. Lanhee Chen, former policy director for Romney’s 2012 presidential campaign, joins the podcast to discuss. Plus, commentary by “FOX News Sunday” host Chris Wallace. The Brian Kilmeade Show, 9 a.m. ET: Deroy Murdock on the latest in the government shutdown and border security standoff; Col. C.J. Douglas on President Trump’s plans for U.S. troops in Syria and Afghanistan; U.S. Rep. Peter King, R-NY, on the 116th Congress and shutdown talks; Keyshawn Whitehorse on the Professional Bull Riders, Inc. coming to New York City. The Todd Starnes Show, Noon ET: Todd Starnes speaks with U.S. Rep. Rep. Andy Biggs, R-Ariz., about the start of the new Congress and the ongoing government shutdown. Cavuto Live, Saturday, 10 a.m. ET: Apple worries adding to China trade war fears; our market pros break down how bad things will get. U.S Sen. Elizabeth Warren kicks off the 2020 race in Iowa Saturday as some democrats promote big plans for spending; our analysts will debate them. U.S. Sen. John Kennedy, R-La., weighs in on the latest on Capitol Hill as the shutdown continues. National Border Patrol Council President Brandon Judd talks border security days after his appearance with President Trump. 1974: President Richard Nixon refuses to hand over tape recordings and documents subpoenaed by the Senate Watergate Committee.